The Wall of Sound begged for a Home Theater extension. Here is my attempt at Home Theater. If you looked through the Wall of Sound project you might have expected this system to also serve as the sound portion of a home theater setup. Here is a description of how I added home theater to my existing sound system. The two JBL horn radiators are spaced 8 feet apart. I wanted a screen to deploy down from the ceiling and fit exactly between the left-front and right-front speakers. My view screen choice was a Stewart motorized model, with a reflective gain of one, so that guests could view the screen at any angle without any difference in brightness. A screen with higher gain would look brighter, but only through a small angle perpendicular to the vertical centerline of the screen. The screen deployed is 96 inches wide by 72 inches deep. This is sufficient for 4:3 aspect ratio NTSC viewing, as well as 16:9 for HDTV and DVD displays. I was concerned that the four 30" Electro Voice drivers directly behind the screen would induce noticeable vibrations in the video, especially during heavy bass activity. Fortunately, even at the loudest levels of ear-splitting bass, there is no discernable distortion in the video projection display. The next problem was the projector. I required the ability to watch a movie in the afternoon sun, not necessarily with direct sunlight on the screen, but with direct sunlight on a curtain closing off the southerly windows of the viewing room. This required a projector with at least 2000 lumens in order to effect any kind of a decent contrast ratio. With 2000 lumens and in a darkened room, I would have plenty of video dynamic range to match my audio system's dynamic range. 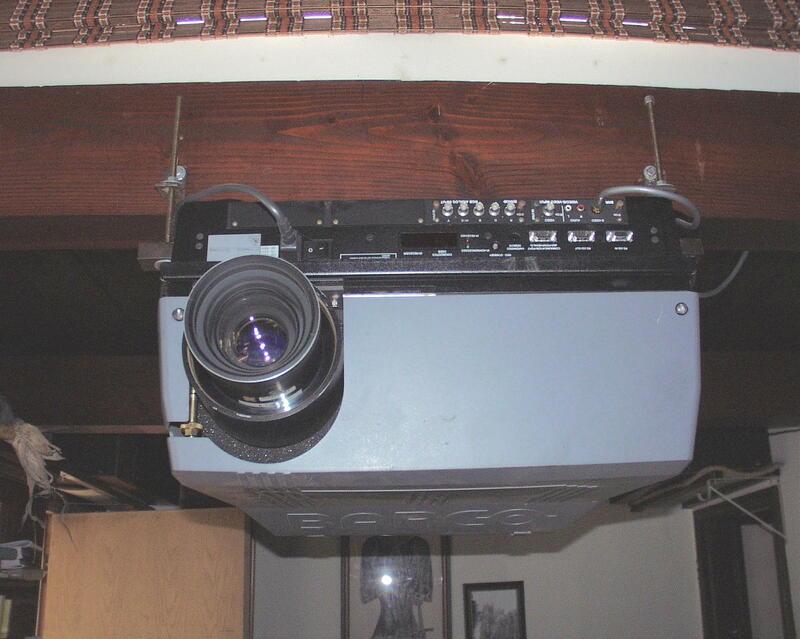 I settled on the Barco 8200 LC also known as a "light cannon" which I ceiling mounted at the opposite end of the viewing room. This required a 2:1 lens in order to exactly match the width of the screen at that projection distance. With the Barco powered with 120 VAC, it doesn't quite produce 2000 lumens, but when powered off the the 220 VAC mains, it produces more than my required 2000 ANSI lumens. Barco designed a power factor corrected power supply, which allows the projector to be powered from any voltage source from 108 VAC to 240 VAC. At the higher voltage, it goes into a boost mode, which increases the brightness significantly. Here are a couple pictures of the unit mounted on the ceiling. The 8200 LC weighs 162 pounds without the 16 pound lens, and getting it mounted required some rigging. Three strong people can heft it up there, or I can do it alone with some pulleys and rope. I bought the initial Barco from a video rental shop in Texas where they do concerts and large presentations for seminars and such. They were upgrading to a later model and sold it to me at half price. Since then, I have purchased several more as spares from government surplus at considerably less money, and now have a collection of long-throw lenses should I need to change the physical configuration. If you want my opinion on what projector to purchase, I can only recommend the Sony SXRD cinema projectors. The SRX-R110 for instance has a native resolution of 4096x2160 and can project two side-by-side full resolution HDTV images simultaneously! 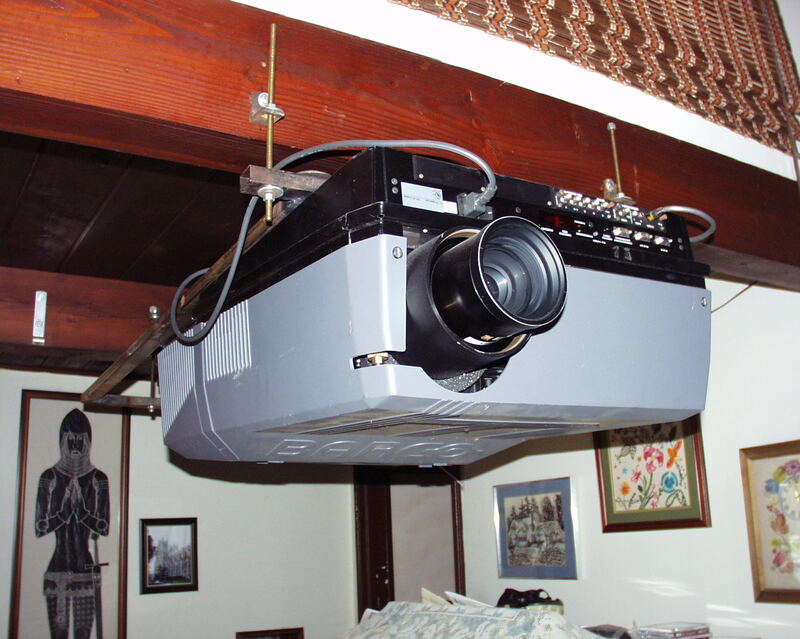 What good is that in a home you ask?...3D!! They have the lumens and the contrast ratios to beat all of the competition, (3,000 and 10,000 lumens) but their high cost of $60,000 to $100,000 (plus $15,000 for the lens!) is only for the pros or the rich.